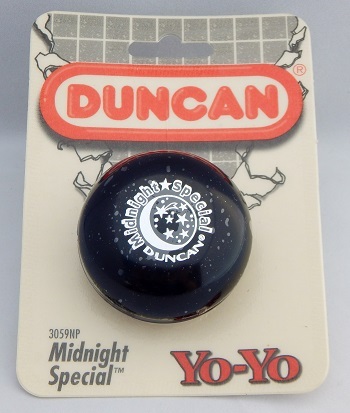 The Duncan Midnight Special was introduced in 1988 and first appeared in the Duncan Toys 1989 catalog. There is very little that distinguishes the Midnight Special from the standard Duncan Imperial other than the body color and stamp. Hard plastic body with a fixed steel axle, starburst response, and cotton string. This model is from the mid-1990s, about 1994. The Midnight Special has been out of production for more than 15 years (as of 2018).